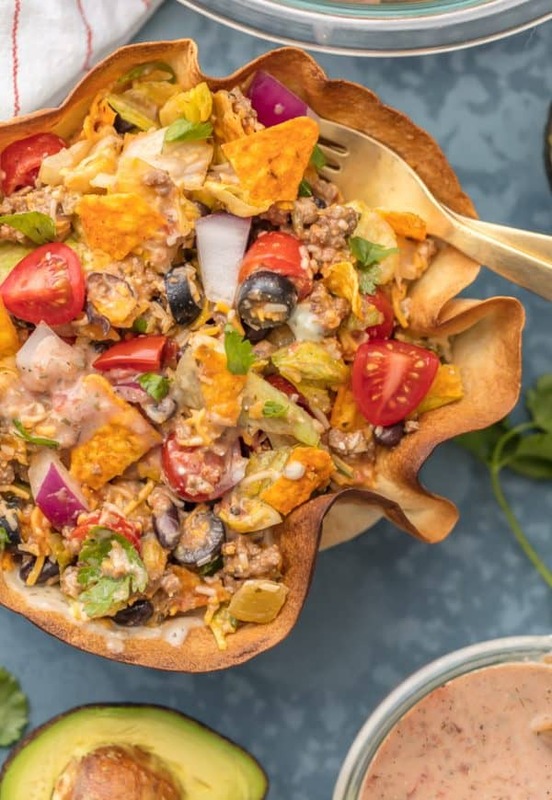 This Creamy Taco Salad is the ultimate fun party meal for game day. It’s simple, perfect for a crowd, and oh so delicious! Hi all! 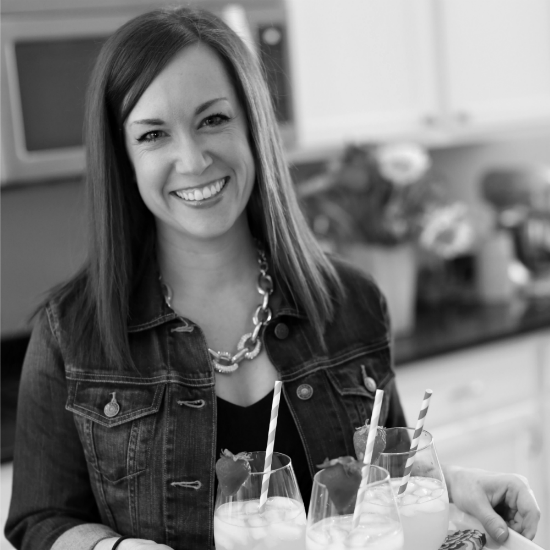 It’s Becky from The Cookie Rookie back with another fun and easy (SUPER EASY) recipe! I’m a new mom, so at our house we are all about making meals as simple as possible. That being said, every Sunday is still filled with football, and that means good food is a must. Nachos, wings, and all the fixins can be nice, but sometimes I crave a hearty salad instead. 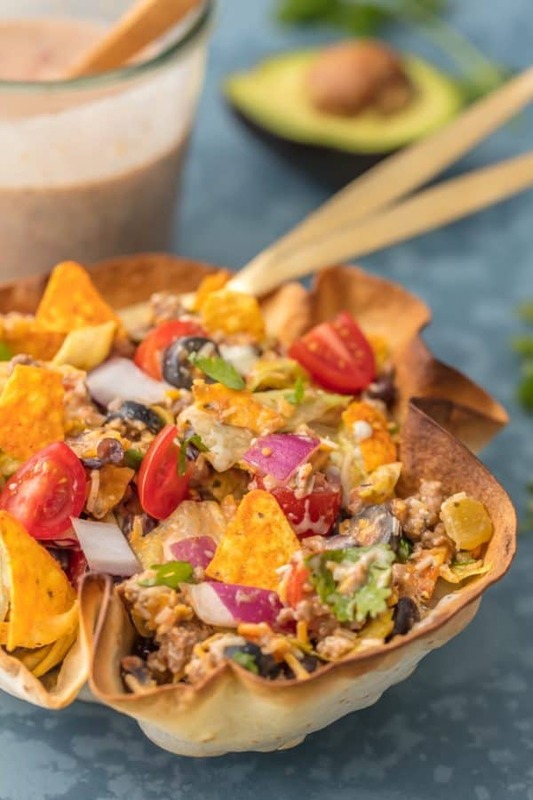 I’m not claiming this Creamy Taco Salad is healthy by any means, but it does have a lighter feel than your typical game day eats. It’s a fresh take on a classic recipe, and I hope you love it as much as we do! 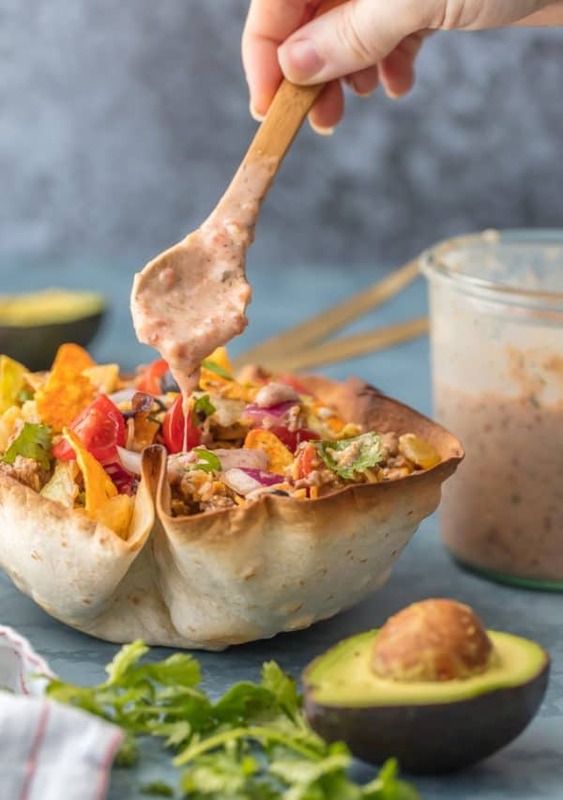 The key to making this fun and easy recipe unique is mixing thin salsa with your favorite creamy dressing. The result is Tex Mex perfection. 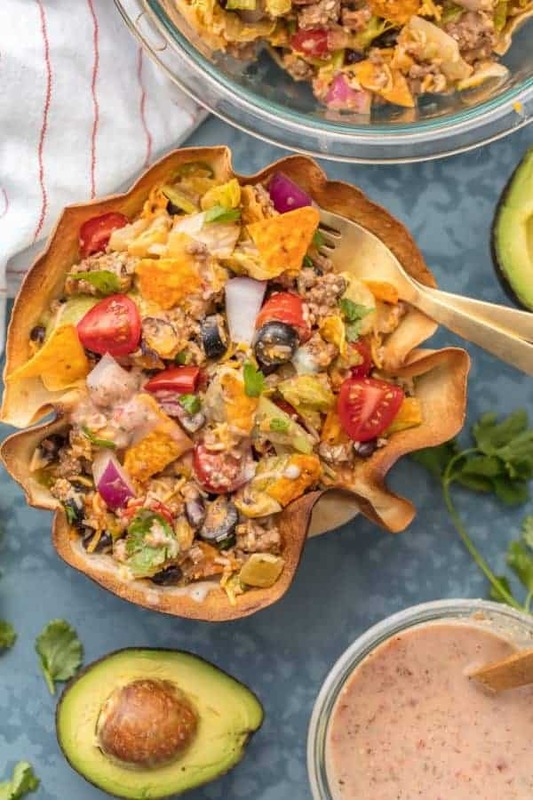 The ultimate dressing to set your Taco Salad apart. Whether you’re watching football with a crowd or just home with your family and need something fast, this is sure to please. Preheat oven to 425F. Brush or spray both sides of each tortilla with olive oil. Place torillas inside oven safe bowls to create the shape you desire. Bake for 10-15 minutes until crisp. Remove from oven and let cool completely. Set aside. In a dutch oven over medium heat, heat 1 tbsp olive oil and add beef. Crumble as it cooks. Add taco seasoning and tomato sauce and allow to cook down until it's your desired consistency. Drain excess sauce. In a large bowl mix together the lettuce, beef, beans, olives, cheese, onion, cilantro, tomatoes, and chips. Toss to combine. In a small container stir together the dressing and salsa. Pour over the salad and toss to coat. We had this for dinner tonight, it was delicious! Thank you for this great recipe! Oh, I did leave out the cilantro and green chilies because we don’t care for them.